Recently, Joel Rasmussen called me about an article that he had found in an old magazine. 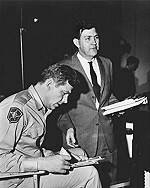 It was about a man named Gerald Holladay that had won an Andy Griffith look-a-like contest back in 1961. Joel was wondering if I would want to run a small article about Mr. Holladay. 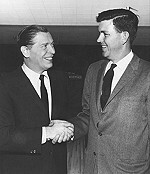 Meeting Milton Berle was part of the prize. At that time I thought that it would make an interesting little story especially since I'm always looking for small articles to fill in space. Then after Joel mentioned that he had purchased a photo at a collectors show that had Mr. Holladay and Bob Sweeney standing in front of a sound stage, I suggested that maybe we could find Mr. Holladay and get a little more information on the contest itself. That's when it really started getting interesting. Reg gets a little help with the make-up from Andy and an unknown interloper. According to the article, Reginald lived in Kentucky at the time so I ran a phone search on everyone with that name in the eastern half of the United States and came up with 3 phone numbers. Unfortunately when I called these people they thought that I was a nut or something. I then did a search on all "R. Holladays" and ended up with a dozen or so possibilities. It was then that I thought that I had better come up with a way of inquiring about the contest winner. I decided that I would just say that I was looking for the Reginald Holladay that would have been associated with "The Andy Griffith Show" back in the early sixties. The first 3-4 calls all gave me the same answer, "I'm sorry, you must have the wrong number." Then on the next try I received a different reply. "Is this some kind of Joke or something?" It was then that I told the man that I was from The Mayberry Times and That I was serious. That's when I heard, "Then you must be talking about the Andy Griffith look-a-like contest." BINGO!!! 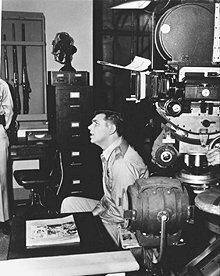 Bob Sweeney offers Reginald a few pointers outside the soundstage at Desilu. After talking with Mr. Holladay for a short while, he went into the story about the contest. It seems that at the time he was head chemist for the Marquett Cement Company in Ashland, Kentucky. One of the secretaries at that company contacted him to see if she could submit one of his photographs to an Andy Griffith look-a-like contest. He felt as if it were just another office prank since he didn't really look like the Sheriff of Mayberry. Reginald tells me that he had followed Andy's career all along and would even on occasion recite a few of Andy's comedy monologues. "You could find us watching "The Andy Griffith Show" every Monday night, but I don't think that I look like Andy Griffith." Well about two weeks later after arriving home from work, Reginald received a phone call from Isabelle Seldon of "Rogers & Cowen," a firm hired by General Mills to handle the contest. She then told him that he had been selected as the winner. His prize would be an all expenses paid trip to Hollywood and a brief appearance on "The Andy Griffith Show." He was asked if he could come out in about two weeks. Even at this point he thought that it was an elaborate joke being played on him by the "girls" in the office. Knowing that he had a very important business meeting in Chicago he said that he would be unavailable at that time. Mrs. Seldon then offered another week that agreed with Mr. Holladay's schedule and she ask him if he wanted to buy his plane tickets and then be reimbursed when he arrived in Hollywood or did he want them to go ahead and just mail them out to him. "Andy and I got along great. In between takes he would tell funny stories and make everyone laugh. it was such a happy atmosphere and everyone seemed to enjoy it." Not believing that this call was for real, he told her to mail them out to him. Well, much to his surprise, it only took about 4 days to get the tickets in the mail, which finally made a believer out of him. Now he was getting excited, not only about the trip, but all of the attention that he was receiving from the local newspapers and television stations. This was BIG! When Reginald arrived in Hollywood, he was met at the airport and taken to the Hollywood Roosevelt Hotel, which was across the street from Mann's Chinese Theater. 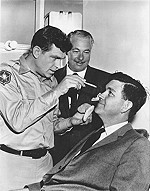 The next morning he was picked up and taken directly to the studio where he was introduced to Andy Griffith and the rest of the crew. He then watched as they filmed all of the courthouse scenes together. During a break, Andy signs a few autographs for his "look-a-like." He remembers one where Will Wright (Ben Weaver) comes into the courthouse and walks over to Andy's desk to have Andy serve an eviction notice to the Scoby's. Will was having trouble with one of this lines and after about 10 takes he said, "Well, hell, let's just do the Christmas episode again" causing the entire set to erupt into laughter. Another one of this special memories was getting on the front porch set with Francis Bavier. When he asked if she enjoyed the show, she told him that it was real nice but that she preferred the stage to television, because you would get an immediate reaction from the audience. It was a day or so later that Reginald would get his acting debut. They were shotting the scene of the rummage sale in the courthouse, so he originally had two lines at the very beginning of that scene, but do to recent editing to allow for more commercial time, you can see him talking with Andy but you only here the theme music instead of the dialogue. Originally he asked, "How much for this Andy?" Then Andy replied, "Oh $4." Reginald then said, "I'll take it." While in California, Reginald was given a few mementos to remind him of the trip. First of all they presented him with a script that was signed by all of the actors and the crew. But his favorite gift was an original "Sheriff" badge that was actually worn by Andy Griffith on the show. Unfortunately he has since misplaced it, but he's sure that it will someday turn up again. Here you see Andy setting where his desk should be with the camera behind him. Both his desk and the courthouse wall have been removed to shoot the scene where Ben Weaver is standing in front of his desk. Notice the Mt. Airy newspaper next to Andy.